Quinoa lovers have been put on a bit of a guilt trip with stories suggesting that the increased demand in the U.S. has put the superfood out of reach for those living closest to where it’s grown. How can poor Bolivians in La Paz afford to pay three times more for quinoa than they would pay for rice, critics have asked? So some quinoa farmers in Bolivia and distributors are talking back. And what they want us to know is that their incomes are rising. As the price of quinoa has tripled since 2006, and farmers plant more of the crop, they’re typically making more money. A combine harverster at work in a quinoa field in Pukara, southern Bolivia, in March. Bolivia produces 70 percent of the world’s quinoa. “To me, quinoa … is absolutely changing the lives of our regional community of people,” German Nina, a quinoa farmer, said during a conference call organized by Alter Eco Foods, which sells quinoa products that are fair trade certified. Eduoard Rollet of Alter Eco adds that when he visits the farmers that he buys from in Bolivia, he finds that they are typically setting aside a portion of the quinoa they grow so that they can eat it themselves throughout the year. “The farmers who have been eating quinoa traditionally are still eating quinoa,” he told me. And since their incomes are up, “they’re able to now afford [foods such as] tomatoes and salads and veggies, and foods that they weren’t able to afford before,” Rollet says. And he’s not alone in thinking that the quinoa boom has been good, on balance, for rural communities in Bolivia. It is “very good news for small, indigenous farmers,” says Pablo Laguna, an anthropologist who has studied quinoa’s influence on local communities in Bolivia. Quinoa’s popularity, he says, is bringing more income to the southern highlands, traditionally one of the poorest regions in Bolivia. Laguna has also worked as a consultant to Alter Eco. Laguna acknowledges that “quinoa prices are definitely higher” for locals. But among the rural and farm families of southwest Bolivia, “households have not diminished … their quinoa consumption,” he says. In some instances, Laguna says, llama herders in the regions are eating a bit less quinoa because of the price, but they’re still eating more than most other households in the world. He says that these families recognize and appreciate quinoa’s nutritional value. Nutritionally, it’s a superstar, since it contains an ideal blend of essential amino acids that form a complete protein. And quinoa has become a vegan-foodie favorite, known for its nutty taste and satisfying texture. 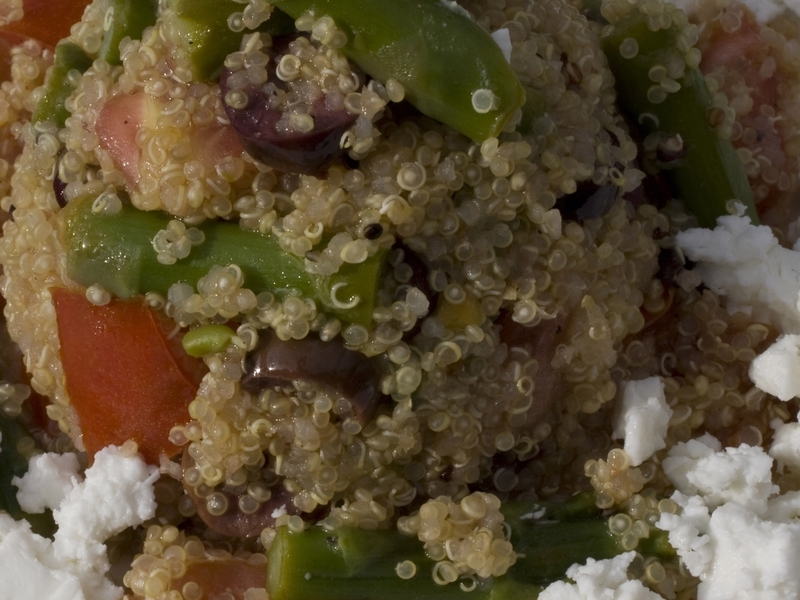 A salad of asparagus and quinoa, a superfood prized for its nutty taste, satisfying texture and protein content. 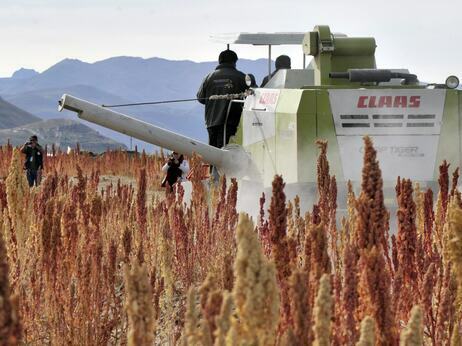 So if quinoa farmers are still enjoying this crop, what is the downside of the boom? Some would point to the cities of Bolivia and Peru. I’ve already mentioned that quinoa is three times more expensive than rice in La Paz markets. And according to an article in The Guardian,quinoa is more expensive than chicken in markets in Lima. These prices do likely put quinoa out of reach for poorer people. But Laguna notes that while quinoa has been a staple for rural Bolivians, it isn’t one for city folks. Bolivian President Evo Morales has weighed in on the issue as well. Though some press reports from 2011 suggested domestic consumption was down, Morales says otherwise. “It’s not true that due to an increase in the price of quinoa, less and less is being consumed” in Bolivia, The Associated Press quoted Morales as saying in an article in February. In fact, Morales pointed to a threefold increase in domestic consumption of quinoa over the past four years. Editor’s Note: You can hear Allison discuss this story with Robin Young on Here & Now, a show from NPR and member station WBUR.